One of my favorite events is back! Twinspires.com has announced that The Road to the Derby Showdown, a contest requiring participants to place $20 show bets on 17 designated Triple Crown prep races, as well as the Triple Crown races themselves, kicks off this Saturday, Feb. 23. The contest races are the Grade II Risen Star Stakes at Fair Grounds and the Grade II Fountain of Youth Stakes at Gulfstream Park, the latter of which is expected to mark the three-year-old debut of early Kentucky Derby favorite Violence. Given the lucrative prizes offered in the Showdown — $1 million, a share of a $10,000 pot and tickets to Churchill Downs on the first Saturday in May — I thought it might be wise to go over some strategies for earning a share of the loot... I consider it my call to booty (sorry, I didn’t get much sleep last night). Anyway, the first thing to remember about the contest is that it is all about cashing tickets — something I’ve warned players against falling in love with when one is betting solely for profit. Obviously, a value-conscious player would much rather cash one out of three tickets for $17 than three out of three tickets for $7. For the sake of the Showdown, however, the latter scenario is more desirable. 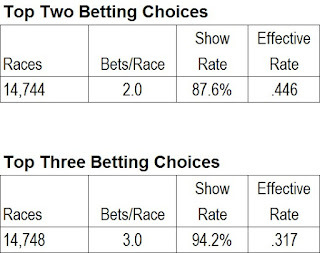 The second thing to keep in mind is that show betting is a bit different than win betting. As is the case when one is trying to profit from a negative show pool, the goal is not always to find the most likely winner, but, rather, the horse most likely to hit the board. Hence, one-dimensional steeds, e.g. need-the-lead types, are often best shunned. RACES: The number of races studied. 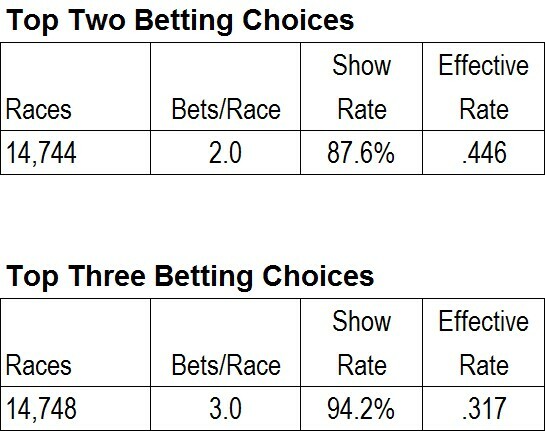 BETS/RACE: Number of qualifying horses, or wagers, per race studied. 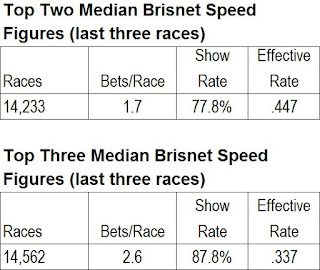 SHOW RATE: The chance, expressed as a percentage, that at least one of the qualifying horses hit the board (finished third or better). 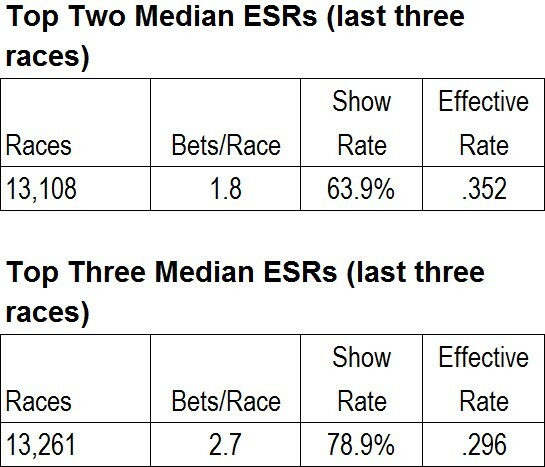 EFFECTIVE RATE: Measures the effectiveness of the criterion used and is obtained by dividing the Show Rate by the Bets/Race. 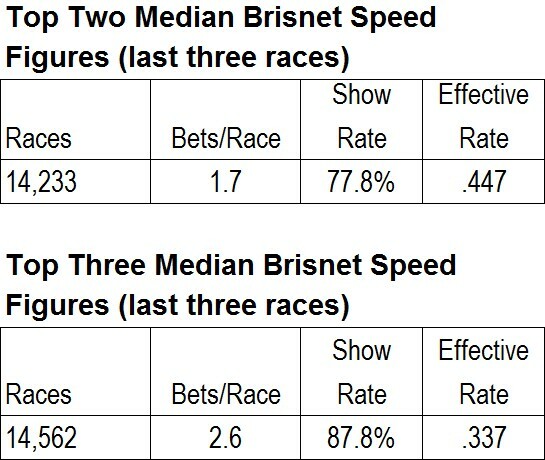 Note: If two or more horses were tied for the same position, their rankings were averaged. For example, if two horses tied for the top spot in a particular category, each was assigned a ranking of 1 ½ (average of positions 1 and 2); if three horses tied for the top spot, each was assigned a ranking of 2 (average of positions 1, 2 and 3); and so on and so on. 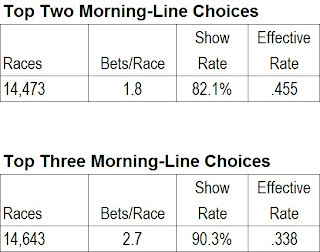 Shockingly, concentrating on the top two horses with the lowest morning line odds proved to be the most effective means of determining which horses were likely to finish in-the-money (among the methods I tested). However, let’s utilize as many of these techniques as possible on Saturday’s big races and see if we can reach a consensus choice in both the Risen Star and the Fountain of Youth. Top two median LSRs: 9-Normandy Invasion (-4) and 14-Departing (-5). Top two median BSFs: 6-Palace Malice (101) and 4-Code West (97). 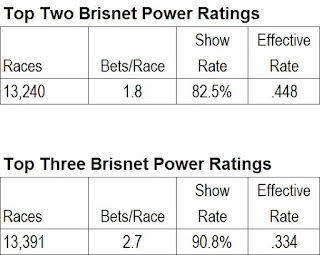 Top two Brisnet Power Ratings: 6-Palace Malice (141.0) and 9-Normandy Invasion (140.3). 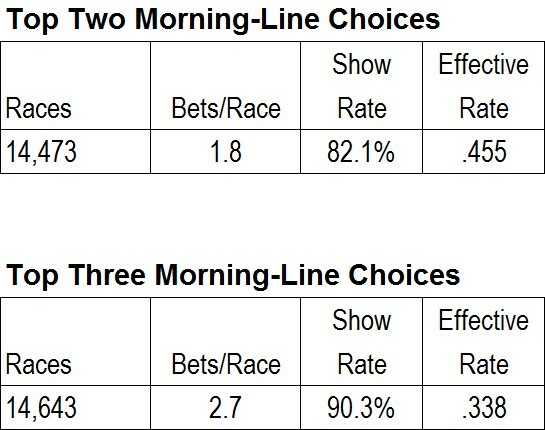 Top two morning-line choices: 9-Normandy Invasion (5/2) and 10-Oxbow (5/1). If name repetition means anything, Normandy Invasion looks like the best show candidate in this spot, as he’s ranked among the top two in several categories. I’m particularly impressed with his late speed rations, given that Fair Grounds — and this prep in particular — tends to favor horses that can motor home late. Click HERE to get a free Win Factor Report for Saturday’s Fair Grounds races. Top two median LSRs: 1-Orb (-9) and 8-Speak Logistics (-10). Top two median BSFs: 3-Violence (96). 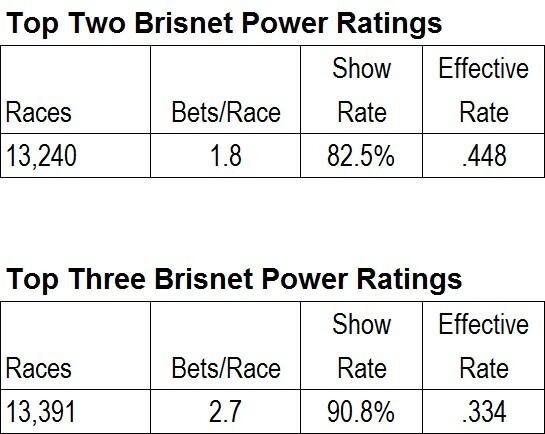 Top two Brisnet Power Ratings: 3-Violence (148.3) and 4-Majestic Hussar (136.4). Top two morning-line choices: 3-Violence (9/5) and 6-Cerro (4/1). Trainer Todd Pletcher’s Violence leads in three categories and would have to be considered the safest show bet in the Fountain of Youth (keep in mind that price is not a consideration in the Showdown challenge, so don’t be afraid to play favorites or near-favorites). That said, I am incredibly interested in Speak Logistics as a potential upsetter on Saturday. After recording an insane -15 ESR in the Breeders’ Cup Juvenile, jockey Angel Serpa chose to rate the son of High Cotton in the Sam F. Davis and promptly got shut off while making a move on the rail rounding the far turn. On Saturday, top rider Joel Rosario will be in the saddle and I think Speak Logistics could be poised for a career-best effort at what promises to be a big price. 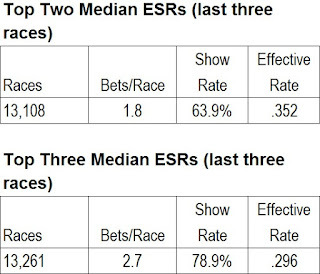 Click HERE to get a free Win Factor Report for Saturday’s Gulfstream Park races.